We are running a stewardship campaign this autumn to encourage us to think about how we use our money, the part money plays in our Christian discipleship and to ask you to consider increasing your giving to St Mary’s. Over the next month we will be looking at different aspects of stewardship in our services on Sunday. Talking about money can be awkward and uncomfortable, however how we use our money both demonstrates what our values are and directly influences the world around us in all sorts of ways. Can I encourage you to pray about how you use your money over this time, to give thanks for all you have received and to remember God’s generosity and compassion for us all. Thinking and praying about our finances is a very powerful way of engaging with our faith and reflecting on how our faith shapes our lives and where we find God day by day. My hope is that this campaign will not only improve the finances of the church but also deepen our relationship with God. I do hope that you will take time over the coming month to think about giving and your Christian faith and to think about how and how much you give to St Mary’s. The Church of England recommends that its members aim to give 5% of their net income to the church and 5% to other charities. If this feels too much for you to manage, would you consider increasing your giving by 5%? It would be appreciated if everyone could return the reply form at the bottom of this page. Can I end by thanking you for all you already give to St Mary’s, not just financially, but also for your generosity with your time and skills. It is the generosity of our church community that makes St Mary’s so rich and vibrant. 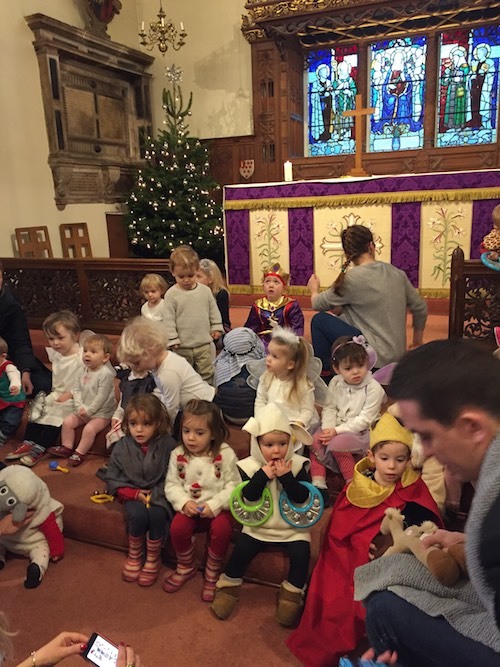 As a family, St Mary’s is blessed with members of all ages. We are particularly blessed with many older people who have been faithful to the church, often for the whole of their lives and who are very generous in their support of the Church. In recognition of this, and the particular needs that people have at this stage of life we have recruited an Associate Vicar, Nils Bersweden. An important part of Nils’s work is to take the lead on Pastoral Care at St Mary’s, particularly in regard to the older members of the congregation. Employing a second permanent priest at St Mary’s is costly and while we can afford it this year, we need an increase in regular giving to secure his post in the long term. We believe that his appointment is part of valuing the contribution that older people make to the life of St Mary’s and we hope that you will do so too. Your giving has enabled us to invest in our ministry to families and children, most notably in the appointment of a Children and Families worker. The focus on families with children has led to the growth of The Service @ 11.15 from a small handful of families to a thriving congregation which averages around 80 people a week. We also have a lively Sunday School, playgroups, Toddler Praise, and groups for junior school age children and teenagers. We support the work of teaching the faith at our outstanding Church School, Bishop Gilpin. Many Christians worry about the future of the church and the faith of younger generations. I am proud that here at St Mary’s, because of your generosity, we are nurturing the faith of children and young people. St Mary’s has a long tradition of excellence in music and worship that we are able to sustain through your generosity. Our Choir, Director of Music and Assistant Director of Music are outstanding and greatly add to the quality and beauty of our worship. The Choral and Organ Scholarships along with the choristers help to ensure the future of the Anglican choral tradition both here and in the wider church. As a church we are here to love and worship God and to love our neighbours. This guides and informs what we spend our time and money on as a church, as we seek to give Glory to God together on Sundays and throughout the week. Your giving supports this. St Mary’s is a beautiful and iconic building. It is steeped in history as Christians have worshipped here for over a thousand years. Our bells call people to worship across the parish and sound to celebrate the joys and sorrows of the community, as they have done for centuries. Just like everyone else we have regular bills to pay and repairs to do to maintain the buildings. As we are blessed in ministering in a very wealthy part of London we do not have access to the funds and grants that many other churches are able to make use of, so we have to find the resources to pay for the maintenance and development of our buildings ourselves. Our Church Wardens and Treasurers work very hard to ensure we get the best value for money we can, but we need your help to pay for the work that needs to be done. St Mary’s also gives 5% of its income to other local, national and international charities. You can find out more about this in our Charitable Giving Policy. We are anticipating a deficit of £69,000 in our budget this year. While we can meet this deficit from our reserves, we need to significantly improve the level of giving to secure the ministry of St Mary’s for the future. Please return printed reply forms to the box in Church or to the Parish Office in an envelope marked for the attention of the Planned Giving Officer, Jane Moss or send your reply form attached to an email to .